An aerial view showing the site where The Hillock project will take place in Marsalforn with the Qolla s-Safra on the right. 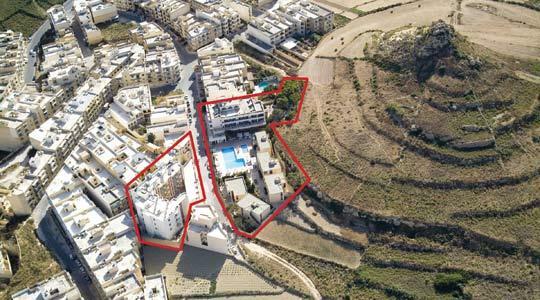 An €18 million residential project by property developer Baron Group in Marsalforn has been given the green light for development by the Malta Environment and Planning Authority. Excavation work on the 150-apartment residence - The Hillock - which will have Il-Qolla s-Safra as its backdrop, will start shortly. The project will be built in one phase over a period of three years and will occupy the site of the former three-star Atlantis Hotel in Marsalforn Bay. Gozitan entrepreneur and group director Xavier Tabone says the project will give the fishing village of Marsalforn a boost. The island must be marketed across the board, predominantly as a safe haven for the family. Known for its endeavours in national heritage restoration projects, rehabilitation of abandoned farmhouses into luxury residences and other high-class developments, the group has now embarked on this innovative contemporary project. "Marsalforn and other localities in Gozo can afford to blend cutting-edge design with old characteristics, without ruining the aesthetical aspect of the place, thus adapting to a modern living environment," Mr Tabone says. "It is high time that localities are enhanced with more creativity in building structures, materials and finishes. We need to foster the idea that buildings are an extension of one's personality rather than just a place to live in, and move away from the uniformity of traditional square block of apartments." Through the use of open spaces and maximised apertures, the company has made extensive use of light, and has incorporated 50 different layouts for each unit to specifically steer away from a linear structure. Aimed at first- and second-home buyers, including Gozitans, and semi-retired foreigners, the residences will be launched in mid-March in the UK at property expos in Surrey and Mayfair, and locally towards the end of this month. In a current deep recession scenario, is such a huge investment feasible? Will people buy? Mr Tabone says although there is a slowdown in the property market and everyone is more cautious, people are still investing. "Interest rates are down compared with past years, which makes investing in property tempting. I dare say it's the best time to invest." Green measures are being taken to ensure that the project is environmentally-friendly. Waste separation during demolition is taking place entirely on site. The exercise has started with the separation and disposal of hazardous materials, such as aluminium and steel, and others harmful to the environment. Glass is also being sent to recycling plants. The company is also planning to have a waste management system on site once the project is completed and in use. This will include a number of waste depots, among other facilities. Hollow precast bricks are being used for insulation purposes, since the project is exposed to the sea. An insulation system that makes use of thermal panels will also help save energy from an air-conditioning unit by about 65 per cent. These panels will be used mainly on all exposed roofs. Ceramic panels on the façades of the building will help keep temperatures inside warm in winter and cool in summer. The Hillock will be split into a number of differentiated blocks, each with its own entrance, serving only a small number of apartments. There will be a choice of one-, two- and three-bedroom units, most with en suite facilities, with a typical three-bed apartment covering an average floor area of 120 square metres, all having lock-up garages. The building will also have a property management service on the premises, which will attend to maintenance needs and properties in the tenants' absence, a superintendent system extensively used in other European countries, together with a fully-fledged diving school.